SpaceX has officially announced a mission swap, resulting in the Falcon 9 launch of the CRS-10 Dragon to the International Space Station (ISS) becoming the first mission to set sail from the historic 39A pad at the Kennedy Space Center (KSC). That honor was to have gone to the Echostar 23 mission before Dragon’s priority effectively pulled rank on the manifest. Changes to the running order of SpaceX’s launch manifest has occurred a number of times before. 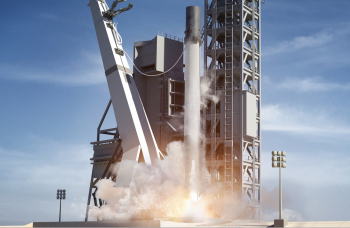 However, with SLC-40 out of action until at least the Spring – and more likely the Summer – the company only has LC-39A in its near-term plans for launches out of the Eastern Range. With 39A still not ready to debut in its new role with SpaceX, the first mission set to launch from this pad – the Falcon 9 launch with EchoStar 23 – was pushed to the right a number of times. Although 39A is very close to being ready to conduct launches, EchoStar 23’s launch date was deemed to be too close to the mid-February target for the CRS-10 Dragon mission. SpaceX and NASA discussed the situation on Friday night, before deciding it would be prudent to place EchoStar 23’s launch after CRS-10, allowing engineers to finalize modification and checkout work on the famous pad and simultaneously avoid a potential delay to the important Dragon mission to the Station. Per the Station’s busy Visiting Vehicle schedule, only a certain amount of launch dates and windows are available for Commercial Resupply Missions. The ISS Program has also said they are low on the number of experiments available for crew members to conduct, placing additional emphasis on the need for both Dragon and Cygnus to pick up the pace this year. EchoStar 23, a telecommunications satellite, does not have the same pressure of launch date availability, resulting in the decision to swap the running order. Ironically, even if 39A is classed as ready to conduct launches, there won’t be an advance on the February 14/15 launch date target, given the Dragon payload is run on its own schedule per the experiments she carries to the orbital outpost. One such example is a group of mice that will be launching to the Station, with their own readiness timed specifically for a launch no earlier than the mid-February target. “SpaceX announced today that its first launch from Launch Complex 39A (LC-39A) at NASA’s Kennedy Space Center in Florida will be the CRS-10 mission to the International Space Station,” noted SpaceX in a release to the media. 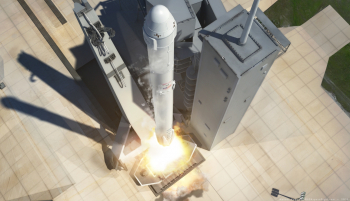 “The launch is currently targeted for no earlier than mid-February. As noted in the release, the rockets for both the CRS-10 and EchoStar 23 missions are already at KSC undergoing processing inside the Horizontal Integration Facility (HIF) in the company of a previously launched Falcon 9 booster. The two Falcon 9’s awaiting launch differ in the fact that EchoStar 23’s booster won’t be returning for a landing and is classed as an expendable rocket, whereas the CRS-10 Falcon 9 booster will be making the trip back for a landing. Both of KSC’s famous LC-39 Pads have been transformed from their previous role in hosting Space Shuttle launches. Pad 39B is now a “clean pad”, ready to host NASA’s Space Launch System (SLS), with the first launch expected at the end of 2018. 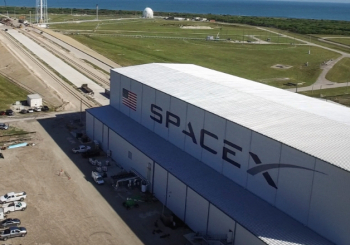 LC-39A is now leased by SpaceX and is currently in an interim stage of transformation, allowing for launches of Falcon 9 and Falcon Heavy rockets. Additional work – such as the removal of the Rotating Service Structure (RSS) – will be completed later this year. However, the bulk of the physical changes were completed some time ago, with the construction of the HIF and the infrastructure that allows rockets to make the short journey up the pad’s ramp on the TEL (Transporter/Erector/Launcher). Tests of the TEL – which can host both Falcon 9 and Falcon Heavy rockets – have been ongoing since last year, mainly relating to rollout tests. Erection testing showed off the size of the structure, to the point that some observers mistook it as a Falcon 9 rocket arriving at the pad over recent days. The rollout and erection tests are a major part of the required fit checks with another key element of the pad, namely the launch mount. This has – according to sources – been one of the major challenges of the path to pad readiness. 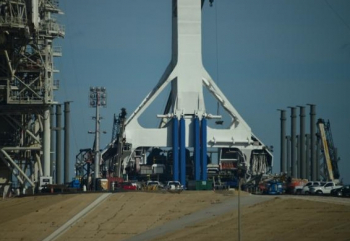 Nonetheless, TEL testing has been proceeding to plan, with the first “Throwback” test completed, which will be a change to how the Transporter Erector performs during a launch. Normally the TE retracts away from the rocket with just over three minutes to launch. However, the “Throwback” method will see the TEL remain in place, before retracting, rapidly, at T-0. The next milestone for the pad will be the debut rollout of the Falcon 9 for the CRS-10 mission for the Static Fire test. An opportunity to shake down the pad, via the firing of a landed booster, was removed due to the problem of pad readiness. 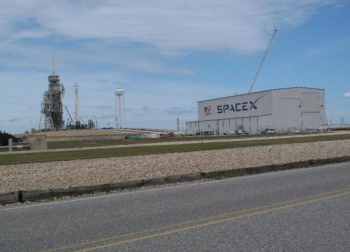 Testing was moved to SpaceX’s test site at McGregor. While an updated schedule is yet to be acquired for the CRS-10 flow milestones, the Static Fire for the EchoStar 23 mission was scheduled to take place on Monday. As such, the likely target for the CRS-10 Static Fire will be around four to five days prior to the launch date.